Are our political leaders doing enough to prevent domestic violence? October is Domestic Violence Awareness Month. Read the article below, originally published in the New York Times, and take action above to contact your reps and make your voice heard. When Kaylee Kapatos posted on Facebook this month that she was a survivor of domestic violence, using the hashtag #WhyIStayed, the response among her friends was muted. Over the past year, the #MeToo movement has transformed culture, in many ways expanding beyond sexual assault and harassment to become a transcendent force for empowering women. There have been discussions about what it’s like for women to go on bad dates, how women must calculate the risk of mundane tasks like selling an item online or going on a run, and why it’s important to believe womenwhen they tell their stories. But how does domestic violence, one of the most common ways women suffer at the hands of men, fit into that conversation? October is domestic violence awareness month. We talked to experts and survivors about why the conversation around domestic violence differs from sexual assault and what would need to change for domestic violence to have its own cultural reckoning. Domestic violence victims often have serious safety concerns that keep them from sharing publicly. In 2018, the National Domestic Violence Hotline and its youth outreach effort, loveisrespect, have experienced a 30 percent increase in calls, texts and chats compared with the same period last year — a larger than usual year-over-year increase. “We think #MeToo is part of that,” said Katie Ray-Jones, the chief executive of the National Domestic Violence Hotline. She believes that domestic violence victims identify with the national conversation, but that they feel safer speaking confidentially as opposed to sharing publicly on Facebook or Twitter. Unlike posting generally about sexual harassment or disclosing a past sexual assault without naming the perpetrator, simply identifying as a domestic violence victim online could expose an ex as an abuser. After the #MeToo movement went viral, the National Coalition Against Domestic Violence created its own hashtag, #SurvivorSpeaks. “It really was a thoughtful look at what we heard, which was, ‘We so appreciate that we’re talking about sexual assaults and #MeToo but, basically, what about us?’” said Ruth M. Glenn, the coalition’s chief executive and president. She said there was an added layer of victim blaming in domestic violence relationships because the abuse happens over many months and years in what people view as a consenting adult relationship. “People have a really difficult time understanding, why doesn’t she leave?” Ms. Glenn said. Ms. Kapatos, who broke up with a college boyfriend who she said was jealous and controlling and threatened to kill himself if she left, tried to answer that question with her Facebook post. #MeToo has shown the strength of multiple accusations, but domestic violence victims usually speak up alone. The #MeToo movement has shown what can happen when women agree to stop staying silent. But in most cases, men have not been held accountable until multiple women have spoken up. That’s difficult to replicate in domestic violence cases, where there is one victim in an isolated relationship who is unlikely to know about past abuse, said Ebony Johnson, the founder of the Next Chapter, Corporation, a grass-roots support group that works with victims of sexual and domestic violence in Maryland and Washington, D.C.
Ms. Johnson, a 39-year-old veteran who works for the Department of Housing and Urban Development, is a survivor of both. She was raped by a stranger when she was 15, she said, and as an adult, she divorced after her husband choked and threatened to kill her. She later got a protective order against a boyfriend who abused her. The boyfriend had a domestic violence case filed against him in an earlier marriage, Ms. Johnson said, but she did not find out about it until after he became abusive toward her. The man has since remarried. Victims haven’t seen others hold domestic abusers accountable. 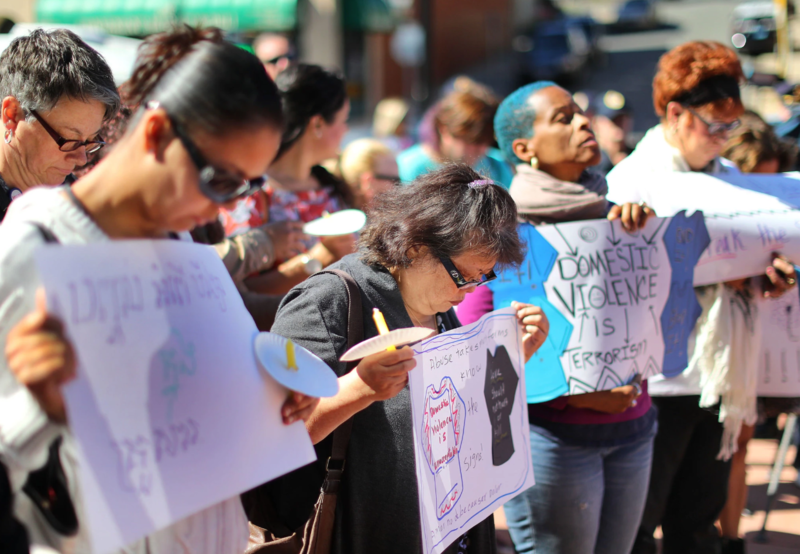 There is another element missing from the conversation surrounding domestic violence: public outrage. Like it or not, experts say, it often takes a high-profile celebrity case to start a cultural movement. For domestic violence, that first happened in the 1990s when O.J. Simpson was accused of killing his ex-wife, said Paige Flink, chief executive of the Family Place shelter in Dallas. “It’s like when it happens to regular people it’s not as real as when it happens to a celebrity,” she said. But Mr. Simpson was acquitted at his criminal trial. The singer Chris Brown was largely forgiven after he pleaded guilty to the 2009 felony assault of his girlfriend at the time, the pop star Rihanna. This year, Rob Porter, the White House staff secretary, resigned after two former wives accused him of physical abuse, but President Trump has talked about bringing him back. One in four women — and one in seven men — have experienced severe physical abuse by a partner, according to the National Domestic Violence Hotline. Abusive behavior can also include verbal threats, stalking and sexual violence. If you or someone you know is being abused, support and help are available. Visit the hotline’s website or call 1-800-799-7233.